JetSolaris® LED lightbars are recognized throughout the industry for their durable and fuel-efficient streamlined shape. 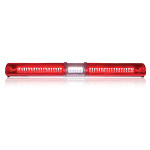 The versatile platform makes this lightbar a popular choice in law enforcement, fire and work truck applications. Available in five lengths, the moisture-resistant JetSolaris lightbars stand up to the most demanding weather conditions. JetSolaris LED lightbars are engineered with the latest in optical efficiency and performance. This family of lightbars is engineered with Federal Signal's patented ROC (Reliable OnBoard Circuitry™) technology which, eliminates potential failure points found in a typical lightbar to keep vehicles on the road longer. Solaris® LED reflector technology maximizes light beam spread and directs it where it is needed most. The 48" through 72" LED models are available with halogen or LED alley, take down and work lights. These models have an optional SignalMaster™ for directional warning light, halogen traffic clearing light and brake/tail/turn LEDs. There are plenty of options available in this mutlipurpose LED lightbar.